Out of all of the types of repairs that can add value to your home, repairs to a garage can bring back almost as much as you spend. When you’ve got a garage door to repair, deciding on the right garage door materials can be confusing especially if you’re in an extreme weather location. If you’re not well versed in the types of materials that garage doors are made of, you could find the whole affair daunting. Here are some of the most common garage door materials and why you might want to choose them for your climate. Steel garage doors are probably the most common type of garage door materials you can find anywhere around the country. They’re inexpensive and require very little effort to maintain them. 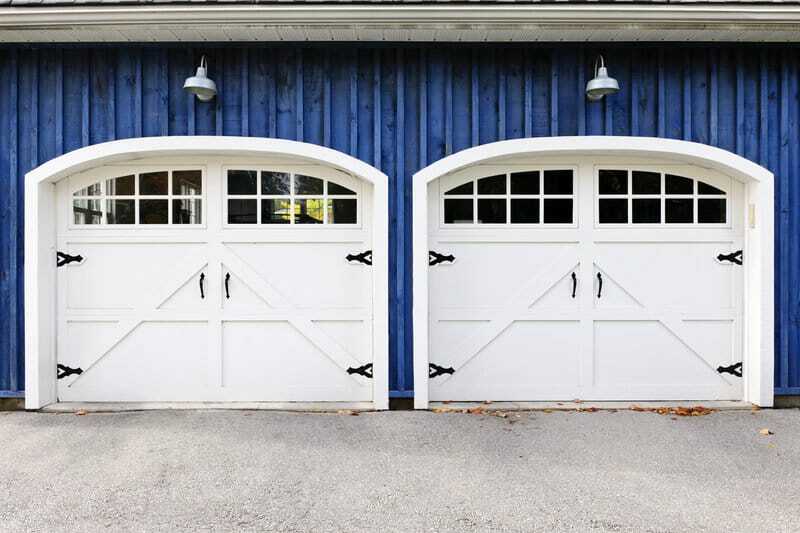 And while they might seem like a limited choice, you can get them in just about any color imaginable and have them finished to match a mostly wooden garage. On top of that, you can add some window panels to a steel door that will allow natural light to get in. If you’re going to be working out, finishing projects, or having band rehearsal all year round, windows will make it seem less claustrophobic. You can have a common steel door and still have something that looks unique. The thing about steel is that it’s not a material known for insulating from the elements. However, with layers of galvanized steel that garage doors are made from, insulation can be added to make things feel more insulated. If you’re in a very cold climate, steel might be difficult to keep a garage warm with. But with added insulation, you can reduce noise and even lower bills from other materials you can’t add insulation too. If you want to have a natural look, good insulation, and avoid any kinds of maintenance related to corrosion, rust, or decay, fiberglass is the best solution. Fiberglass doors are made out of a steel frame with fiberglass built on top. This makes for a sturdy door that can be great for hotter climates where you want to keep the inside of your garage liveable. It’s hard to do a quick oil change or a little bit of cleaning of your vehicle when it’s oppressively hot so your fiberglass door should make it easier. Because there are so many colors and styles available, you can match your home easily with a fiberglass door. Without having to worry about the maintenance that other doors require, you could have a strong and distinctive weatherproof door. Wood brings a lot of gravitas to any kind of home or decor. When you choose wood, you choose to bring in the feeling of a natural elegance that is classic and won’t ever be out of style. The qualities that wood brings with it also come at a price. Wood is sensitive, can deteriorate over time, and will need constant protective coating and maintenance. What you trade for your time is great beauty. If you can keep your door from incurring a lot of sun, weather, or water damage, you’ll have a strong and lovely door that will last for years. If you live in a moderate climate, good is a great choice. However, you can’t expect a wooden garage door to bring you the insulation you get from fiberglass. While you’ll get plenty of reliable functionality, one of the main reasons to choose a wooden door is to maintain the look of the garage or to match the material that your garage is already made of. Sun-drenched or hot climates can be rough on wood, breaking down the finishes on your wood, making it harder to keep it looking good against the elements. While it might sound like a strange choice for a garage door, glass is a great way to maintain the views of home overlooking a lovely vista. It’s also an option for keeping high-end design covering every element of your home. If your living room or your adjoining room has a largely glass external wall, adding a glass garage door can make the design cohesive. If you have a home that’s made chiefly of glass and metal, adding a fiberglass door to save money could undermine the design of your home. You want to make a design statement with every choice you make, so why overlook what your garage door could be bringing to the conversation? If privacy is important, you can have your glass garage door panels frosted or tinted. You can also add safety glass or acrylic to make it more secure while not interfering with natural light. If the other doors on the list don’t cut it or if you’ve got tight budget constraints, vinyl might be the obvious choice for you. While they might seem like a budget conscious solution, they look great on oceanfront property that could face degradation from salt and sand. Rather than worrying about corrosion or deterioration, vinyl can outlast the elements. If you want insulation, vinyl doors are a great choice. They’ll look good for years because of their ability to resist UV exposure. They may not be able to match the finish of your garage but could make up for it greatly with the savings you’ll see to your energy bill. You might even be surprised at how well they complement your home’s exterior. If you’re trying to decide the right garage door materials for your next garage door, you need to balance out the needs of your climate. Making the wrong decision could leave you with a door that needs to be replaced in just a year or two. If you’re trying to repair your door on your own, check out our guide to avoid common pitfalls.